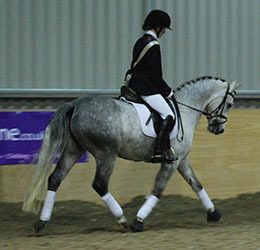 The SPSS is delighted to announce that there will be another Young Dressage Pony Championships this year at Bury Farm, Buckinghamshire on Saturday 30th November. This Championships is being sponsored by the SPSS, supported by BD and organised and run by Bury Farm as part of their BD High Profile Show. 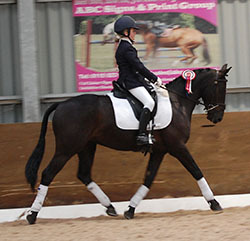 There are sections for 4, 5 and 6 year old ponies and there are no qualifiers, so entry is direct to the Championships and is open to BD registered and un-registered ponies up to and including 148cms (149 cms with shoes) in height ONLY. Riders/owners need not be BD members and may be any age. Although late entries will be accepted if there is still space in the class, early entry is advised. Entries close on the 17th November. 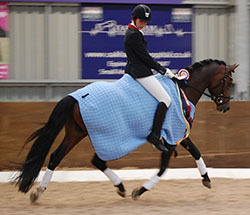 2011 Champion - the German-bred 4 year old stallion Der Kleine Lord pictured wearing his SPSS Thermatex Rug prize, ridden by Erin Williams and owned by her mother, Clare. Spectators are welcome at this event and a running order will be available including information about the breeding of each pony. The Bury Farm Clubhouse will be open serving hot and cold food and drinks and there will also be information about the SPSS and our graded stallions, mares and youngstock. Stabling: Stabling is available, please contact Bury Farm Reception on 01525 222114 to book. Invited Judges: Jenny Ward (British Dressage List One Judge and past British Dressage Pony Team Selector) and Darryl Thickitt (British Dressage Pony Team Trainer and International Rider). Click here to download a Schedule & Entry Form with Rules and list of Prizes. The schedule is also available in Adobe PDF format here - click here to download the Adobe PDF reader if you don't have it already. Class open to PONIES only. Ponies up to and including 148cm in height (149cm with shoes). 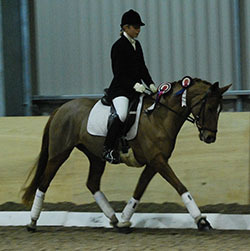 Open to both BD-registered and non-BD registered ponies; owners & riders need not be BD members. Age of pony is to be taken from the 1st January in the year in which it was born. To be run under BD rules. To be judged as per BD Young Horse classes unless specifically stated otherwise in these rules. Whips only allowed in 4 year old class. If spurs are worn, they must be blunt spurs without rowels. Ponies must be ridden in snaffle bridles. Dressage Tests may be "called". Entries may be made on line but please complete the special entry form as well (so that breeding information can be published). The 3 top scoring ponies over all sections will be required to attend a mounted prize giving otherwise prizes (including money) will be forfeited. * Prize Money of £50 to highest scoring pony across all sections; £30 to next highest scoring pony overall; £20 to third highest scoring pony overall.